Credit: 352628Photo by Jared C. Tilton/Getty Images Kyle Busch, driver of the #18 M&M’s Halloween Toyota, takes the checkered flag before Martin Truex Jr., driver of the #78 Furniture Row/Denver Mattress Toyota, to win the Monster Energy NASCAR Cup Series First Data 500 at Martinsville Speedway on October 29, 2017 in Martinsville, Virginia. 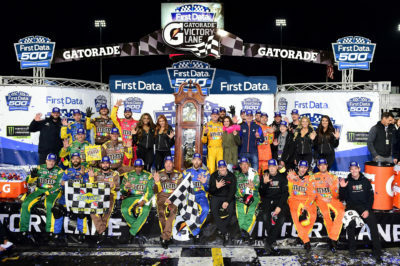 Starting from 14th Place Car 18 Kyle Busch M&M’s Halloween Toyota won the 69th Annual First Data 500, his 43rd win in 459 Monster Energy NASCAR Cup Series races. This is his 5th win & 20th Top 10 finish in 2017. This is his 2nd win & 14th Top 10 finish in 25 races at Martinsville Speedway. This win puts Busch in the final round of the championship at the Ford Ecoboost 400 Sunday November 19 at Homestead-Miami Speedway. 2nd Place Car 78 Martin Truex Jr. Furniture Row/Denver Mattress Toyota, started from 2nd place posted his 8th Top 10 finish in 24 races at Martinsville Speedway. It is his 23rd Top 10 finish in 2017. 3rd Place Car 14 Clint Bowyer Haas Automation Ford, started from 5th place posted his 14th Top 10 finish in 24 races at Martinsville Speedway. 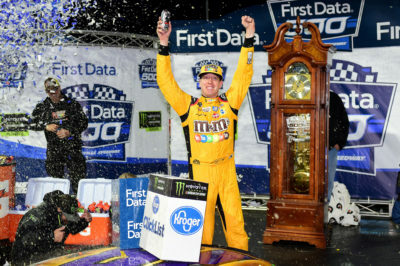 Credit: 352630Photo by Jared C. Tilton/Getty Images Kyle Busch, driver of the #18 M&M’s Halloween Toyota, and his crew celebrate with the trophy in Victory Lane after winning the Monster Energy NASCAR Cup Series First Data 500 at Martinsville Speedway on October 29, 2017 in Martinsville, Virginia. 4th Place Car 2 Brad Keselowski Alliance Truck Parts Ford, started from 7th place followed by 5th place Car 4 Kevin Harvick Busch NA Ford, started from 13th place. 6th Place Car 6 Trevor Bayne Ford EcoBoost Ford, started from 34th place followed by 7th place Car 11 Denny Hamlin FedEx/Walgreens Toyota, started from 6th place. 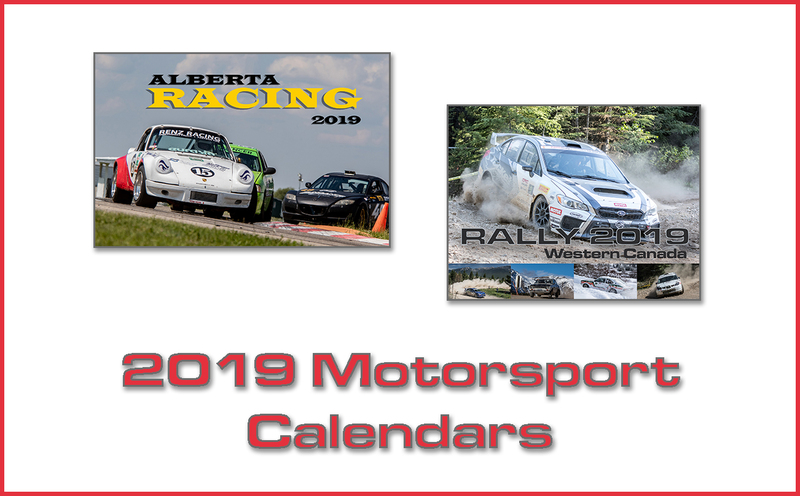 8th Place Car 21 Ryan Blaney (P) Motorcraft/Quick Lane Tire & Auto Center Ford, started from 4th place followed by 9th place Car 20 Matt Kenseth DeWalt Flexvolt Toyota, started from 17th place. Lastly in the Top 10 was Car 17 Ricky Stenhouse Jr. Fifth Third Bank Ford, in 10th place, started from 22nd place. Daniel Suarez (15th) was the highest finishing rookie. Martin Truex Jr. (P) leads the point standings by 17 points over Kyle Busch (P). 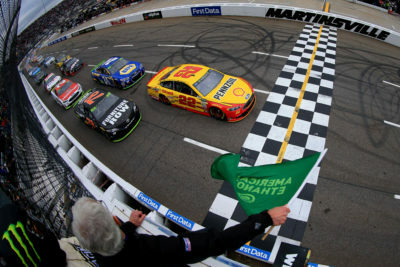 Credit: 352625Photo by Chris Trotman/Getty Images Joey Logano, driver of the #22 Shell Pennzoil Ford, and Martin Truex Jr., driver of the #78 Furniture Row/Denver Mattress Toyota, lead the field to green for the start of the Monster Energy NASCAR Cup Series First Data 500 at Martinsville Speedway on October 29, 2017 in Martinsville, Virginia. Chevrolet Crash in Turn 2. 10th Caution on lap 493 for Car 22 Joey Logano Shell Pennzoil Ford Crash in Turn 2. 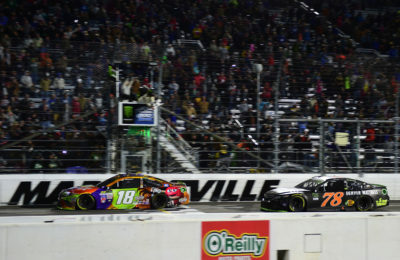 11th Caution on lap 499 for Car 11 Denny Hamlin FedEx/Walgreens Toyota and Car 24 Chase Elliott (P) NAPA Chevrolet Crash in Turn 3.
Credit: 352626Photo by Sarah Crabill/Getty Images Kyle Busch, driver of the #18 M&M’s Halloween Toyota, leads Martin Truex Jr., driver of the #78 Furniture Row/Denver Mattress Toyota, on the last lap of the Monster Energy NASCAR Cup Series First Data 500 at Martinsville Speedway on October 29, 2017 in Martinsville, Virginia. Credit: 352627Photo by Stacy Revere/Getty Images Kyle Busch, driver of the #18 M&M’s Halloween Toyota, celebrates in Victory Lane after winning the Monster Energy NASCAR Cup Series First Data 500 at Martinsville Speedway on October 29, 2017 in Martinsville, Virginia. Credit: 352629Photo by Chris Trotman/Getty Images Kyle Busch, driver of the #18 M&M’s Halloween Toyota, takes the checkered flag to win the Monster Energy NASCAR Cup Series First Data 500 at Martinsville Speedway on October 29, 2017 in Martinsville, Virginia. 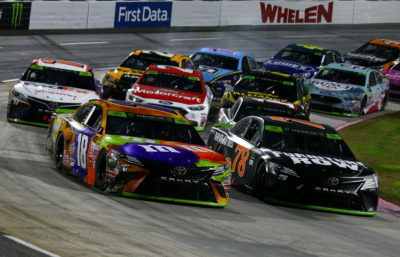 This was an exciting race as Kyle Busch beat Martin Truex Jr. to the checkered flag with a Margin of Victory: 0.141 Seconds. 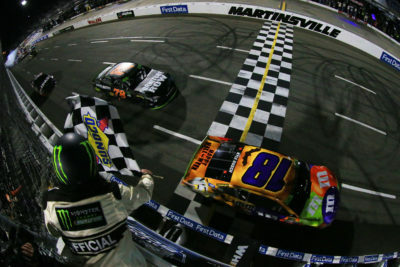 Busch took the lead on the last lap, but this was a race anyone could have won. At the end of the race, Car 24 Chase Elliott was not happy with Car 11 Denny Hamlin for spinning him in the last few laps. Credit: 352631Photo by Jared C. Tilton/Getty Images Kyle Busch, driver of the #18 M&M’s Halloween Toyota, celebrates in Victory Lane after winning the Monster Energy NASCAR Cup Series First Data 500 at Martinsville Speedway on October 29, 2017 in Martinsville, Virginia. 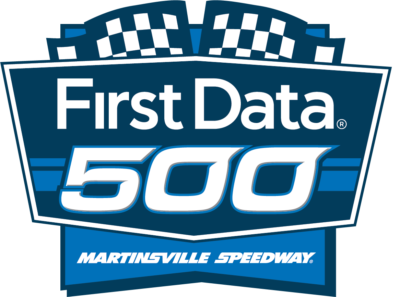 Race Comments: Kyle Busch won the First Data 500 at Martinsville Speedway, his 43rd Monster Energy NASCAR Cup Series victory. Prior to the green flag, the following cars dropped to the rear of the field under penalty: No. 3, 27 and 48 (unapproved adjustments). Failed to Qualify: N/A. Caution Flags: 11 for 74 laps. Lead Changes: 16 among 6 drivers. Time of Race: 3 Hrs, 32 Mins, 47 Secs. Average Speed: 74.902 MPH. Margin of Victory: 0.141 Seconds. American Ethanol Green Flag Restart Award: Kyle Busch, #18. Coors Light Pole Award: Joey Logano, #22 96.504 mph. Ingersoll Rand Power Move: Kevin Harvick, #4 7 positions. Mahle Clevite Engine Builder of the Race: Toyota Racing Development (TRD), #18. Mobil 1 Driver of the Race: Kyle Busch, #18. Moog Go the Extra Mile: Ricky Stenhouse Jr, #17 crew chief Brian Pattie, 0.118 seconds. Sherwin-Williams Fastest Lap: Kyle Busch, #18. Sunoco Rookie of the Race : Daniel Suarez, #19.